Punjapit celebrates with a beer…. Serve our Pumpkin Lager with holiday meals the spice characters really bring out the depth of full-flavored meats and vegetables. Arf, we might trade & upgrade…. The typical darts player is a middle-aged, overweight man who maybe spends a little too much time in the pub — not that we have a problem with any of that. 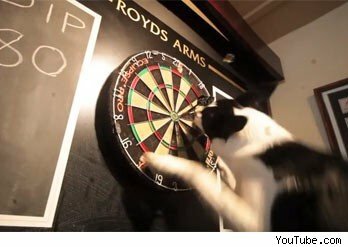 But the darts team at The Royds Arms in Rochdale has just added an unlikely new member… an arrow-fetching Border Collie called Jip. The 18-month-old pooch started off as their canine mascot, but recently got promoted after learning to retrieve darts from the board and return them to players. This prompted the team — who were glad she was saving them from walking to the board and back — to make her an honorary member of the team. Now during matches, Jip will leap into the air and pluck darts out of the board, before running back to the players and dropping them at their feet. Landlord Kenny Hughes, who started off by training Jip to fetch coins, told Rochdale Online: “Jip really is a great asset to the pub and the darts team! A game in which a toy dog leaves ‘little presents’ for children to clean up is set to be one of the best selling gifts this Christmas. The Doggie Doo game gives players a chance to scoop up as much plasticine poo as possible in order to win. The dice game, from manufacturer John Adams, retails for up to £24 and is among this year’s Christmas ‘dream’ wish list for children. This year’s list of ‘must have’ toys – drawn up by the Toy Retailers’ Association – also features Fijit Friends, a fluffy interactive rabbit. It also includes a Fireman Sam Pontypandy rescue set, a hi-tech tablet children’s computer, dolls that double as bedroom lights and perennial favourite Lego. Gary Grant, chairman of the association’s Dream Toys selection panel, said: “This year we have seen some amazing technological advancements from the toy industry. “This does not mean to say that the toys are ‘techy’, rather that technology has been used to enrich the whole experience of play. Wayne Rooney provoked a torrent of abuse after he complained on Twitter about having to play football at noon. A naked driver, flying on “the wings of love”, smashed into 17 cars on a drunken rampage through the streets of Moscow behind the wheel of his car. The motorist, reportedly frustrated with his girlfriend’s refusal to commit, managed to smashed into 13 civilian cars and four police vehicles. A police spokesman said the man “was in a state of insobriety behind the wheel of the car” and lost control the RIA Novosti news agency said. When the man was arrested after a chase, he stepped out of the car clearly drunk and completely naked, the spokesman said. Russian news agencies did not give the name of the driver. However, the lifenews.ru tabloid website, known for its police connections, said he was Moldovan-born, called Vitaly G, and had recently received Russian citizenship. “I was flying on the wings of love,” Vitaly G said in a tape of his testimony obtained by the website. “The day before my loved one said she was no longer ready to have a serious relationship,” he said. He added that he had gone on the rampage out of frustration as the world seemed to be against him. Burton-on-Trent has got its own designer scent which apparently smells of Marmite, leather, pickle and beer. The city, said to smell of ale from the surrounding hops fields, has inspired the bizarre new perfume called Eau-de-Burton, reports the Daily Telegraph. Businesswoman Victoria Brookes thinks her new fragrance works perfectly and is selling it for £36.50 in the run up to Christmas. She said: “Burton is known for its smell but not always in a good way. But the perfume smells really good – I have had lots of compliments from people. “It is made up of Gourmand, representing Marmite and Branston Pickle, which were invented in Burton. “It also has leather, representing the boots and footballs used at Burton Albion, and Ambra, inspired by amber nectar, the beer which made Burton famous worldwide. Ms Brookes owns a bridal shop called Weddings2Go where couples can use her Blue Box perfume service to create their own scent for the big day. But Victoria has revealed she’s not expecting too many to go for her Eau-de-Burton concoction. “It’s more of a novelty item for die hard Burtoians who might want to give their loved ones something a bit different in the run up to Christmas,” she said.